You are here: Home / Free Bet Bonuses / Mobile Sportsbook Promotions / Sportsbook Bonuses / Sportsbook Promotions / Play at Tipbet and Collect €5 eSports Free Bet! Play at Tipbet and Collect €5 eSports Free Bet! Add €5 to your account with eSports Free Bet at the online sportsbook Tipbet! Join the online sportsbook Tipbet and claim €5 eSports Free Bet today! It’s all fast and easy – to get the eSports Free Bet all you have to do is enter the following Bonus Code: eSPORTSFREE. And then online sportsbook Tipbet will credit your account with €5 Free Bet. Use the eSports Free Bet on any games at the online sportsbook: Counter Strike Global Offensive, Dota 2, League of Legends and StarCraft II. Daily tournaments can see you win great prizes that can range from €2,000 all the way up to €10,000 and even more! It all depends on how much you’re willing to bet, so the bigger your stake is the more you could potentially win. To withdraw your winnings, the bet selections that you place have to be at least 1.80 (4/5) and only multiple bets with two or more selections will qualify towards the rollover requirement. Additionally, the eSports Free Bet can only be used on eSports events. Besides the eSports Free Bet, Tipbet offers a full range of Welcome Bonuses when you join the online sportsbook, so make sure to use every offer to the max. The offers are among the best in the online sportsbook industry, which helps when you’re making tons of bets regularly. Betting Herald can offer you insights on how to play eSports, so your eSports Free Bet won’t go to waste if you’re a noob. Have a look through eSports Betting Guide for more info on how to become the best player and earn the biggest cash prizes along the way! 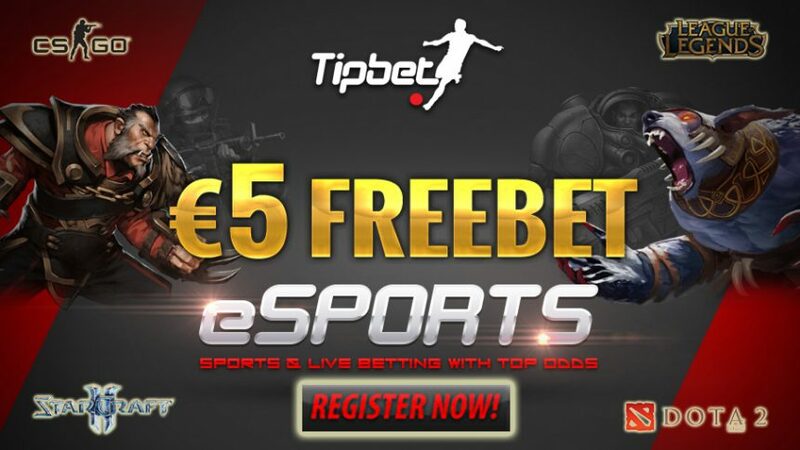 Register online sportsbook Tipbet now and get the €5 eSports Free Bet! Join Tipbet to collect €5 Sports Free Bet! Europa League Final Bonus: Get $100 Free Bet with Intertops Sports!